Katerina Wilczynski (1894-1978) was born in Poland and worked in Germany. She worked as a painter, illustrator and etcher. While she produced portraits and cityscapes she mainly worked as a landscape artist. 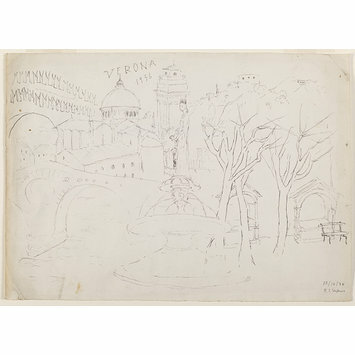 This drawing in pen and India ink represents different sites in Verona, with the title "Verona" and the year 1936 being written at the top centre of the composition. In the right centre of the foreground is a garden with a fountain and the Ponte Pietra leading of the page in the centre left of the composition. In the middle distance Wilczynski depicts the dome of the Basilica of St. Zeno and the tower of the Piazza dei Signori. At the centre of the composition a woman shown wearing medieval dress, possibly alludes to the ill fated lovers from the city, Romeo and Juliet. This combination of different sites and a figure creates a feeling of the rich variety of sites in this city in the Veneto, a region in the North East of Italy. 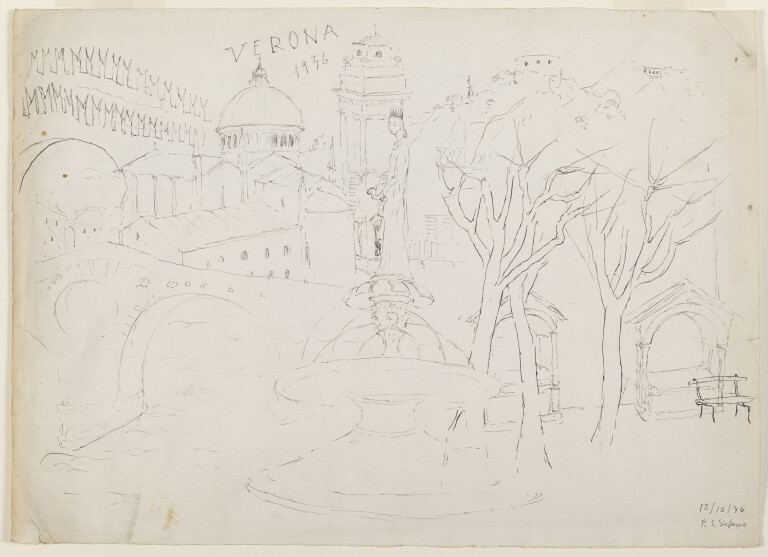 Pen and indian ink sketches of buildings, a bridge and a fountain in Verona.